On January 15th 2009, US Airways Flight 1549 had to make an emergency water landing on the Hudson River due to bird strike. This saved the lives of 155 passengers and crew members. The pilot responsible for this incredible feat was Chelsey “Sully” Sullenberger. This actually happened. Sounds like an interesting premise for a movie, right? It’s really not. It’s really awful. Worse still, it’s boring. Director Clint Eastwood has managed to churn out yet another clunky male melodrama about the ‘everyman.’ He has taken a story about a man landing an airplane on the Hudson River and made it a non-event. Tom Hanks as Sully is a large part of the problem. His attempt to be understated and compelling, translates into a languid and dull performance. There are moments when he looks genuinely constipated. However, you cannot really blame Hanks when the film is so strained by Eastwood’s struggle to crowbar tension into the narrative. The director opts out of a simple re-enactment or an interesting character piece, and instead focuses on trying to create a villain in the National Transport Safety Board, the civil servants who were responsible for the subsequent investigation into the landing. Here they are depicted as cynical and snide in what feels like a flaccid effort to create yet another story about the ‘unappreciated’ American hero. It genuinely feels as if Eastwood fabricates most of the unnecessary hostility and arrogance from the members of the board because it simply does not match up to what is depicted in the real life Sully’s autobiography, on which the film is based. Elsewhere in the film, playing Sully’s wife, the fantastically talented Laura Linney is barely utilised in scenes that evoke a Saturday Night Live sketch. She appears only to generate warmth or panic over the phone to her husband. Aaron Eckhart is just as one dimensional as the cringe inducing co-pilot who is merely a collection of “way to go Sully” type lines that make him more suitable for a Judd Apatow bromance. The performances are incredibly uneven. The depiction of the claustral fame that accompanied the landing for Sully works as an interesting contrast to the NTSB’s investigation. The constant media attention must have made for quite a surreal couple of months, adding pressure to the very traumatic experience of, ostensibly, surviving a plane crash. If Eastwood was a little more adept at subtlety, this could have made for compelling drama. Where Eastwood excels as a director is in the action sequences. The re-enactment of the bird strike and the subsequent decision to land on the Hudson River, accompanied by Sully’s announcement to “brace for impact,” leaves you breathless. Eastwood also creates thrilling sequences by portraying the visions that plague Sully throughout the film of the plane plowing into one of the many skyscrapers in the New York skyline. This cannot but conjure up those 9/11 images that filled every television screen across the world in 2001. However, the only act of terrorism here is the emotional terrorism Eastwood tries to perpetrate in an effort to fill out the film’s running time of 96 minutes. He is practically begging for the spectator’s outrage and sympathy. This film cannot stir the emotions. It’s too smug. An argument could be made for this reviewer’s reaction being the result of a contemporary society that tends to be desensitised by its highly mediated nature. 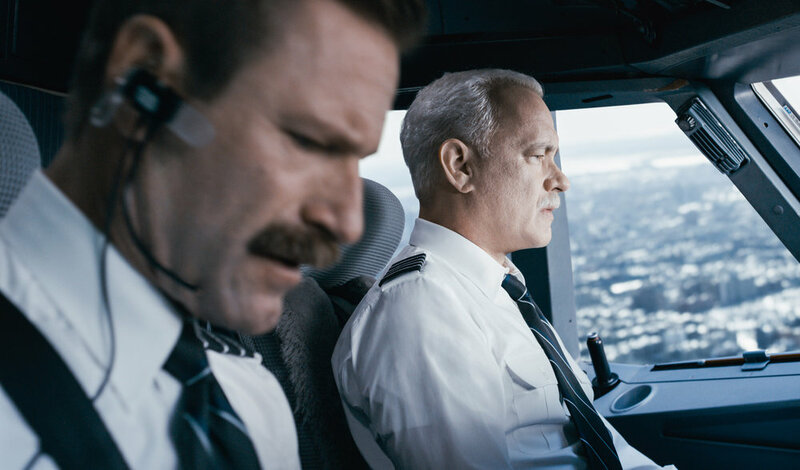 Why doesn’t Sully’s extraordinary story make for compelling viewing? It could be because the film feels like propaganda. There are undertones of a suggestion that Sully was able to pull this off because he is American. It could be because another depiction of a white middle class male as the ‘everyman’ feels dated. Or it could just be that the fault lies with the director’s choices. Bad casting, bad pacing, bad writing, bad Eastwood.